Thank you very much for your answer,but I have one more favor to ask you. Download the zipped file, unpack it and copy the terminal.exe into your metatrader folder. Here's a strange one. Often, but not always, an indicator with text printing using ObjectCreate when it is compiled with zero errors will vanish from the screen after compilation; yet it is still in the indicators list. Deleting the indicator and then dragging a new copy from the Navigator will initialize it and correctly display on the screen. Recompiling again without any changes will cause it to vanish. HOWEVER, I have had occasions when I am moving text around to get it aligned properly where the text will remain on the screen from compile to compile. But the funny is that there is no rule when does it do some things like that : sometimes it does and then sometimes it does not so I can not figure out what is going on. Today, the indicator stayed visible between compiles until additional code was added and then began its vanishing act. 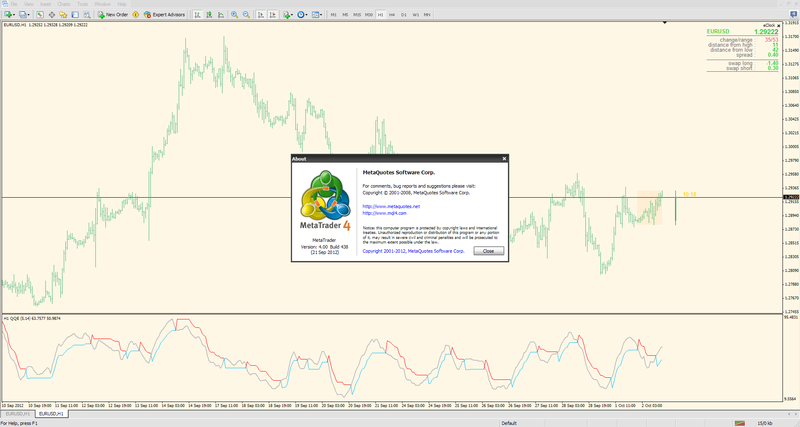 I shut down Metatrader, terminal and editor, and rebooted the system. Upon the next compile after the reboot, the indicator stayed visible. Possibly a memory leakage or problems in reorganizing the code which leads to the removal of the indicator at the next compile? DoubleToString does not check to insure the value parameter is a scalar, not an array. The following code compiles cleanly. Prints as 0.000. I would assume there are a lot of other built in functions that exhibit the same error. It appears that the objectcreate function has an upper limit of 63 for the length of the string that may be printed. I created strings longer than 63 and while they print fine using the Print function, the objectcreate function limits them to 63 characters. Metatrader and I are doing really good this morning.